So uh, I’m down to one project on the needles again. And the Tangled Yoke Cardigan is mired in a sea of stockinette. You know what that means: One Project Paralysis. Must cast on something new! However, I am (chronically) on a yarn diet. Considering the limits of space, budget, and sanity, this is the best thing, trust me. Thus I need to cast on something from stash. But I’m not sure what! Tell me, help me! What should I knit? Lace. I have a skein of Sundara silk earmarked for a scarf/wrap thing for my mother-in-law. It’s a beautiful pink with the occasional streak of sage green. I was thinking of making one of these, but am open to other suggestions. Toy. I’ve got yarn to make a toy version of an oomingmack. Probably not the Vintage Pink Cardigan, as that’s also a sea of stockinette, but maybe the Venezia, which has colorwork to keep it interesting and would be perfect for knitting to podcasts. Thoughts? Suggestions? What do you want to see me knit? CogKnition posted this on July 7th, 2009 @ 10:23pm in Life as a Knitter, Unfinished Objects | Permalink to "What to Knit, What to Knit"
ooo… the lace! the lace! it’s so pretty. what pattern is that? another option is the hanami stole. pink w/ green streaks would go perfectly… like cherry blossoms. The colorway is actually called Cherry Blossom! It was one of Sundara’s limited editions a while back. 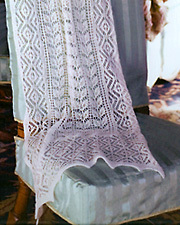 Both of those lace patterns are from Victorian Lace Today; the first is the Alpine Knit Scarf and the second is the Myrtle Leaf Shawl.